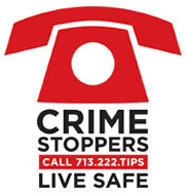 Crime Stoppers and the Houston Police Department’s Robbery Division need the public's assistance identifying the suspects responsible for several aggravated robberies with a deadly weapon. At least four males and one female are believed to be responsible for six cell phone store robberies in south Houston since March 12, 2019. In all the robberies, the suspects rush into the cell phone stores while in possession of weapons and demand money and cell phones from within the store. The suspects have been very aggressive in the robberies and have assaulted the employees when they take too long to respond to demands. Once the suspects have the money and cell phones, they flee the scene in a vehicle that is waiting for them in the parking lot with a female driver. All of the robberies have occurred around 6 pm. On March 25, 2019, officers observed the vehicle, described as a blue Chevrolet Camaro, that was used in the South Park Cell robbery. A short chase ensued and subsequently, an 18 and 19 year old male and an 18 year old female were arrested. The identity of those suspects (as of March 27) have not been released at due to an on-going investigation by robbery detectives. Robbery detectives are still seeking the identity of the other two males that are participating in these robberies. Suspect Descriptions: Black males, late teens to early 20’s.